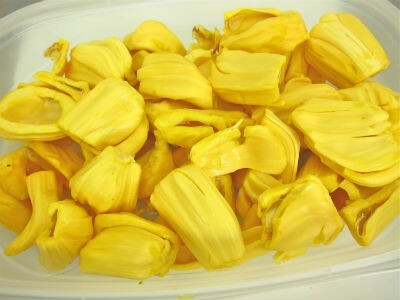 Jackfruit is in season now and here is a simple and delicious recipe. Serve with rice, idli or dosa. 1. Finely chop the jackfruits and transfer to a pan. 2. Pour enough water and boil for a few minutes. 4. Fry the mustard seeds and green chillies for 30 to 45 seconds. 5. Add the boiled jackfruits, jaggery and salt. 7. Add a little water to rice flour and mix well without any lumps. 8. Add to the pan and stir to mix well. 9. Serve with rice, idli or dosa. Feel free to comment or share your thoughts on this Jackfruit Pachadi Recipe from Awesome Cuisine.